I really don't like posting at 4:55pm. That's because it only means I have 5 minutes to write. So, I thought I'd just give you a quick update on our ServFest Sunday. We got 82 different names of people interested in pursuing the technology teams. Praise the Lord! The next step is to invite them to attend a further info meeting in July or August. Also, I sent out a survey to the current production team members to see who wants to continue serving into the next year (Oct2006-Sept2007). Of the 140 people, I've gotten 47 responses, and only 5 are moving on to other areas of service. The Lord is once again proving to be faithful as we start thinking about and working toward teams for the next serving year. Disclaimer: This post is based on a true story. Names have been changed to protect the innocent. Last year, the nameless church that I attend showed a video. Though the video was professional in many ways, one part of it was like the visual equivalent of fingernails on a chalkboard for me. The video included a series of interviews in different locations. The settings were somewhat visually interesting and also somewhat indicative of the people being interviewed. However, in each case, the background was in focus. And the interviewees were all out of focus. Now, to be fair, I'll bet most people didn't even notice, since "out of focus" has gradients and these were only slightly out of focus. Somebody had focused on the background and forgotten the basic principles of focusing and depth of field. I'm going to give a quick overview of depth of field here that hopefully will introduce you to the concept. If you would like more information, applications, and the mathematics behind depth of field, check out the wikipedia entry. Depth of field in a camera image is the distance in front of and behind a subject which are in acceptable focus. In actuality, there is only one plane in front of a lens where the subject will be in perfectly sharp focus, but the sharpness of the focus gradually goes down as you move closer to the lens or further from it. That's why I refer to the depth of field as the range of acceptable focus. What affects depth of field? What control over it do we have on our cameras? Unfortunately, there aren't a lot of options for adjusting depth of field. Basically, you have two options: lens focal length and lens aperture. Lens Focal Length. Lens focal length is essentially how "zoomed in" or "zoomed out" your camera is. Focal length affects depth of field in an inverse way, meaning that as you increase your focal length (zoom in), you decrease your depth of field, making more of the foreground and background out of focus. As you decrease your focal length (zoom out), you increase your depth of field, making more of the fore- and backgrounds in focus. How would this knowledge have helped our videographers in the earlier situation? They could have used depth of field cues to make sure they were truly in focus on their subject. How? If they had zoomed in on their subject, the depth of field would decrease. More of the "foreground" and "background" would have been out of focus and they could see exactly what was actually in focus. Then they could have adjusted their focus to pull the person into sharp focus rather than the books or picture on the wall. Lens Aperture. Aperture is the setting of the camera's lens "iris" which determines how much light is allowed into the camera. If you increase the aperture, the picture will get brighter. If you decrease the aperture, the picture will get darker. Similar to focal length, lens aperture affects depth of field in an inverse way. If you increase the aperture, you decrease the depth of field and vice versa. When you are taking a picture or shooting a video, however, you need to assure that the image is exposed properly by setting the light entry amount with the aperture to the best level for your film. You can't just decrease the aperture (make the picture darker) to increase the depth of field. Therefore, in order to use aperture to adjust depth of field, you actually have to change the lighting. Turn more lights on to decrease the aperture and then increase the depth of field. Or turn the lights down or off so that you have to increase the aperture and decrease the depth of field. Had our example videographers had more lighting for their interviews, they may have had in-focus subjects because the depth of field would have been such that the subject would have been in acceptable focus. Don't let depth of field problems distract from the depth of your message. Sometimes Sundays surprise me. This was one of those Sundays. I wasn't totally mentally prepared for the all the little things that I'd be attending to all morning. With the many details, I unfortunately didn't get to listen to much of the message today. I did catch this as Brian Chesemore's main point: "Jesus calls objects of great mercy to be representatives of mercy to others." I will be listening to the podcast tomorrow in my time with God. You can download the message from Covenant Life's Sermon Audio page. Here are some of the "little things" that surprised me and consumed my morning, in no particular order. Our main mixer was running late this morning, and we weren't sure if he was going to make it, so I set up some of the rough mix. Due to some scheduling change-ups lately, I wasn't sure if we were going to have two, one, or no camera directors this morning. Thankfully only one showed up. The lighting setup from Saturday was slightly off and our lighting person for this morning was in Mexico, so I was making adjustments throughout the morning. Our pastor's E6 moved dramatically in the first service before he began to preach. Thankfully, our sound team leader went up to readjust the mic at the beginning of the message, but only after I had left my office to see what was going on. Twice, we changed the way communion was going down, so I had to communicate then re-communicate to all the tech heads. Two prospective volunteers were hanging out, watching, and asking questions throughout the first service. I had three difficult conversations: two with volunteers who haven't been keeping their commitments and one with a congregation member who thinks the volume is too loud. I had two wonderful conversations with volunteers who want to take on more responsibility starting in October. This afternoon, we introduced a new team leader to the sermon audio volunteers. I preped for that by ordering pizza, getting the room ready, plates and napkins and so on. The church was also having water baptisms this afternoon, so I was trying to pull that together with the help of one our most faithful volunteers. Finally, a photographer came to get pictures of the sound team, so that the worship team members can learn their names. Phew! It was a big day. But it was full of good things, grace-filled challenges, and a God who is faithful. All praise be to him that we pulled it all off! Excellence :|: The quality of being outstanding or really good. Who do you think about when you read this definition? A friend or relative? A famous athlete or musician? A person you envy or fear? Yourself? Do you think of God? God is holy, or separate from us. He is altogether different than us. He stands out in his perfections. He defines the word good. He is truly and fully and immensely good. He gave up his own Son to allow sinners to be a part of his family. God is excellent! And God calls us to excellence as well. We are to be outstanding and really good, through the power of Holy Spirit. Two weeks ago we learned what it means to fear the Lord as we serve the church with excellence. Always excel because God is always watching. Last week we found out that God doesn't call us to excellence because he wants to increase the respect that others have for us. Never excel because others may be watching. Excel because you will gain rewards in heaven. "Slaves, obey in everything those who are your earthly masters, not by way of eye-service, as people-pleasers, but with sincerity of heart, fearing the Lord. Whatever you do, work heartily, as for the Lord and not for men, knowing that from the Lord you will receive the inheritance as your reward. You are serving the Lord Christ." Three major ideas stick out to me from this text related to heavenly reward. First, service that receives rewards requires faith. We must believe that God will actually reward us. "Work heartily... knowing that from the Lord you will receive the inheritance as your reward." If we don't believe that he will reward us, why will we work heartily? Are you convinced that God will actually reward you? Second, though I don't know exactly what "the inhertiance" means, it will be a true reward. God isn't offering us a cheap plastic toy to get us to buy the happy meal of heaven. What he will give us in heaven will fill us with joy, pleasure, and love for him. We are going to enjoy these rewards more than any rewards the world has to offer. Third, we have many opportunities to gain rewards in heaven. "Whatever you do..." is an all-inclusive statement. Regardless of what we're doing -- whether it's running sound, wrapping cables, creating videos, or aiming lights -- if we do that with fear of the Lord, we can expect God to fulfill his promise to reward us. That's a whole lot of chances to improve our inheritance in heaven. Take advantage of it! Now, someone might object, saying that this pursuit of heavenly reward could be a selfish way to gain personal benefit instead of God's glory. If you have that concern, I'd encourage you to listen to a recent message by our senior pastor, Joshua Harris, called "Jesus on Serving." He answers this by encouraging us to not "try to be more spiritual than God." I want to explain a bit further why I think it is impossible to be truly selfish when seeking heavenly reward. Consider the situation: You're in heaven and God is handing out rewards for all the good deeds you did on earth. Let me ask some questions. How did you get to heaven? Wasn't it through Jesus' death on the cross alone, not according to anything you did? Where did your gifts come from? Weren't they gifts from a merciful God to an ungrateful sinner? Where did your strength come from? Wasn't God sustaining your every breath as you served? Why did that serving opportunity exist? Didn't God ordain all the days and the circumstances so you could do that? Why are you getting a reward? Isn't it really because God loves you in spite of your sinfulness and has decided in his excellent goodness to reward you? Is there anyone in heaven who is going to think that you've actually done it, that you deserve this reward? I don't think so. I believe everyone is going to see ever so clearly that only God deserves worship, even though you are getting the reward. Fear and love God so much that you ask him for strength and gifts and opportunities to serve with excellence, and then work heartily because you know he will reward you and in doing so he will be glorified. I try not to spend my entire blogging life referencing others, but here is a post called Worship and Truth from Bob Kauflin that tech and media folks should definitely check out, since we are in the business of context creation. "It’s also true (there’s that word again…) that the meaning of content can change based on its context. But we should use that information to make sure that our contexts of worship support rather than deny or distract from the content we’re seeking to communicate." Summer is officially here. How do I know? Kids are playing outside our home all day, graduation ceremonies are done, and the church calendar has a wedding scheduled almost every weekend for the next eight weeks. One thing summertime means for me as Covenant Life's technical director is the start of preparations for next serving year. Though "next year" doesn't actually kick off until October, I find that I can never start early enough in getting ready for the transition. Each year, people on my teams have the opportunity to switch positions, take on more responsibility, back off a little, or shift to another area of service completely. So summertime means that many changes are most likely on the way. And it's time to get ready! The first step for readiness is puting leadership in place for next year's teams. Two of the current team leaders have decided to step down for the next year. The first is moving to New Jersey for family and work reasons. The second is stepping back a little to spend more time loving and leading his wife and baby boy. With such excellent reasons for their departure, I've been in full faith that God would provide the right new leaders. And as expected, he has come through! Tomorrow, I'm seeking final approval from my pastoral supervisor for the two new leaders that God has mercifully provided. How did we choose these two guys, though? Humility :|: God promises grace for the humble. He also promises opposition to the proud. We need God's grace, so we need a humble leader. Faithfulness :|: God is faithful. He never misses an appointment or fails to show up to help us in our time of need. We need leaders that follow God's example and set the example for the rest of the team. 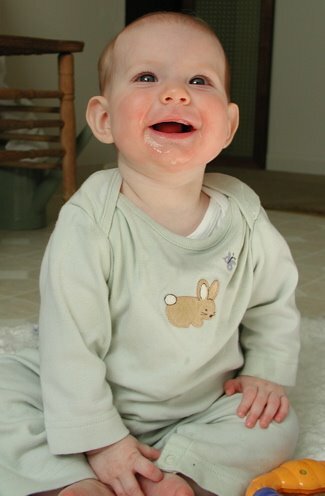 Joyfulness :|: Gospel work is worthwhile and the rewards are great. A leader's heart should represent that truth with joy in the midst of challenge. Leadership :|: True leadership is a gift from God, and God will bless leaders with that gift. How do I identify leadership? Watch to see who's following the person even when he doesn't have a title. Excellence :|: Our church is committed to excellence for God's glory. A leader in our church must share that passion. Initiative :|: Leaders have ideas, share ideas, and implement ideas. They are not only good executors, they are also good initiators. They seek God on behalf of their teams, ask good questions, and propose solutions to problems. True leaders don't always need to be led. Though a potential leader need not be perfect in all these areas, I want to see him growing in all these areas. These are evidences of the work of God in someone's heart. When God's Spirit is active in someone, there's no telling what that person can do for the glory of God by his power. That makes me excited to see what God will do in our next year together. In a recent post on sound pressure levels, I alluded to some basic priorities that are important to understand and use when mixing for congregational singing. We'll now embark on an exploration of audio mixing for worship. Here's a drawing that gives us a starting point for discussion on good sound in church. 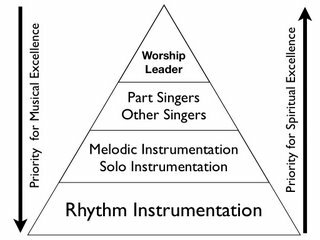 This "mixing pyramid" gives you a sense of the relative importance of each section of an orchestra, band, or any worship team. As we'll see in the future, this really is an oversimplification. Hopefully, I can nuance some of those details as we go along. What I want to note initially, is the "conflicting" priorities of musical excellence and spiritual excellence. For the song to sound good musically, the rhythm section must sound good first, then the other insruments, the background vocals, and the lead vocal. How many modern pop bands prove that great instrumentalists can cause people to overlook a mediocre singer! However, words that lead people to worship the One True God are absolutely necessary for spiritual effectiveness. Without people being able to hear and understand the lyrics and sing along, the excellence of the musicians will be underutilized for God's glory. Begin by quickly making sure the worship leader can be heard. Let the level of the worship leader set the overall level of the band (aka don't start with the drums and then turn everything up to overcome the racket). Get the sounds of the rhythm section next, working quickly through the drums or percussion since they will frequently have many mics that can easily eat up precious soundcheck minutes. Add the rest of the instruments without too much work on the sounds of each one. Now add all the vocalists. Tune in the equalization and compression for all the singers, remember to layer them according to priority: worship leader on top, key parts singers just below that, and the rest just below that. Now go back and fine tune the sounds of the melody and solo instruments. Synths, pianos, strings, horns, etc are rarely way off sound-wise, if you have decent mics. And lastly, go back and really lock in the rhythm section. 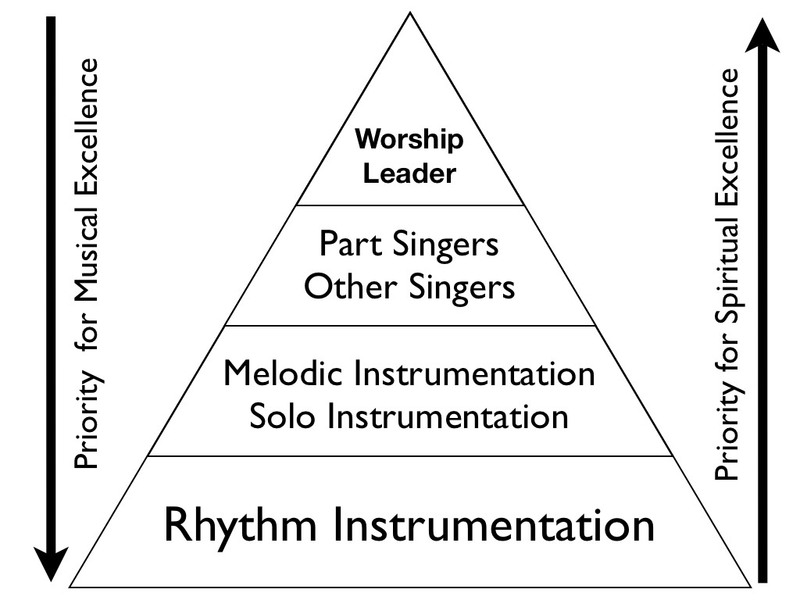 During the whole time, work on relative levels, following the pyramid as a general rule: the higher in the pyramid, the louder that musician should be. Some exceptions to that could be the kick drum, bass guitar, tympani, djembe or other rhythm instruments that have very low fundamental frequencies. Pushing them up a little more than the rest of the rhythm section can help solidify the mix without the risk of overwhelming the vocals. And, most importantly, when soundcheck is done and before the service starts, make sure the words are still winning! Today we're going to talk about every salesman's favorite stat to throw around when selling you a projector. "And this projector over here... It's more ANSI than my six-month-old! Hehehe." Understanding the ANSI lumens of your video projector is a good start to knowing how bright it will be and how good it will look. And with lumens, truly the more the merrier. The only problem is this: the more lumens you get, the less full your wallet is when you leave. Unfortunately, from what I've observed, people tend to buy video projectors based on a comparative sense of lumens. If you're last projector was 3000 lumens, your next one should be, oh, about 6000 lumens or some such wizardry. But lumens are only half of the picture. Your screen size is the other half. And it's a very important 50%. Naturally, the manufacturer can't guess what screen size you will use, so they just list the lumens and make you feel good about getting something brighter than you had last time. But how bright is bright enough when you factor in your screen? I want to begin a revolution here by introducing a good friend of mine: Mr. Foot-Lambert. A Foot-Lambert (FL) is a measurement that takes into account your screen size. With it you can compare projectors that will be shown on different size screens. Also, you can compare a projector to another reference brightness you may be more familiar with (like your TV at home). To find out a projector's Foot-Lambert measurement for your screen, divide the lumens by the square footage of your screen. The singles ministry wanted to add two 9 x 12 screens, one on either side of our main center screen in our sanctuary. The main center screen is 15 x 20 and our main projector is 10,000 lumens. To get all the screens to be about the same brightness, how many lumens do I need the other two projectors to have? If all I had was the number 10,000 lumens, I'd be guessing what I need. What would your guess be? 6000 lumens? 7000 lumens? Let's do just a little math. Wow! So a 3500 Lumen projector would work just fine. That saves me some cash over my initial guess. Your local movie theater probably has a Foot-Lamberts level of about 20 FL for its screens. But remember it always turns all the lights off. A room with some light spill on the screen will probably need a brightness level of 30-40 FL to overcome the wash-out. A room with fairly direct light on the screen will need 40-60 FL of brightness. Your boring television at home is over 100 FL! Your computer screen or HDTV is even brighter! So, when your video creator or your pastor comes to you and says, "It just doesn't look like it looked on my computer screen and high-def TV!" you can tell them why that's the case. When you buy a projector, buy it based on the foot-lamberts it will create on your screen, not based on its ANSI lumens rating alone. Here's a picture of one reason today is such a happy day for me. Thanks, Meg, for bringing your mommy and me so many smiles! The coincidence may seem somewhat unfortunate, and it certainly was unplanned, but the message was nonetheless a wonderful encouragement to all of us to learn from and emulate the example of a kind God who loves his enemies. Indeed, it is very Fatherly to love those who oppose us and give sacrificially over and over to those who cannot repay us. You can listen to the message here when it comes online Sunday afternoon. Also, we had a Father & Son choir today that sang the song, How Deep the Father's Love. It was very meaningful to have boys and their dads exalting their heavenly Father together. Thanks be to God for sending his only Son for our sins and adopting us into his family. Have a happy day rejoicing in the grace of our merciful Father! This weekend we'll look more closely at point two. God is always watching us, seeing us, and evaluating us. His command to us is to serve others because he is watching. However, I know that many days go by when I say to myself, "Did I even think about God today?" The question betrays its answer. I probably didn't think about God. What was I thinking about? I've found it frequently to be true that -- if I'm not thinking about pleasing God -- it's because I'm thinking about others. And I'm not just thinking about them. I'm focusing on them. I'm meditating on what they think of what I'm doing. I'm anticipating what they'll say. I'm hoping to get a good response. I'm afraid maybe I won't get a good response. I'm figuring out how to justify myself if they don't respond the way I want. Most of the time, if I'm not fearing God, I'm fearing man. Either that, or I'm asleep. If you're not familiar with the term fear of man, here's my rough definition. Fear of man is when I value the approval of people more than the approval of God because I want those people to worship me instead of God. Fear of man is a form of pride, a type of self-worship. I want others to think highly of me because I think so highly of me and I'm always right. If we look back at the verses from Colossians, we can see how fear of man works itself out practically. What do these instructions show us about the hearers? "Slaves, obey in everything" :|: Evidently, some slaves were not fully obeying their masters as they would fully obey their Father in heaven. "Not by way of eye-service" :|: It seems that certain slaves were exerting their "freedom in Christ" when their earthly masters were not watching. They served less heartily when left on their own. "As people-pleasers" :|: But when their master returned, they wanted his approval or feared his punishment, so they shaped up at that point. "But with sincerity of heart" :|: These believers were insincere in their service. They pretended to serve unto the Lord when under observation, but served themselves whenever possible. They were hypocrites. "Work heartily" :|: They cut corners whenever possible and truly fulfilled their responsibility only when it protected their reputation or brought them credit. Do you see how this is a form of self-worship? They were more concerned about the assessment of their masters than the assessment of their God because they wanted both the ease that laziness afforded them and the respect of their master. For them, the result of these misplaced desires was laziness. For you and me, the result may be different, but the desires are often the same. We spend hours on graphics because we want to have young and hip people attend our church. We work to never miss a mic cue because we believe that we are worthy of honor, even if we rarely get it. We want the production to be perfect because that's what we believe we are able to do and we want others to believe it too. We work harder and harder and harder because people think of us as hard workers. Now, don't get me wrong. We should put forth effort and pursue excellence. The problem lies in doing that as a result of our desire to be worshipped by others. The problem is our craving to be honored and thanked and spoken of highly and patted on the back and revered and feared and respected and idolized. The problem is this: cosmic treason. We want to be God. And this is when we must repent. We must ask for God's forgiveness for our desire to overthrow him. And then we must turn away from that desire and fear God, serving him, not serving men as people-pleasers. So, spend hours on the graphic. Aim to never miss a mic cue. Seek to perfect the production. Work harder and harder and harder and harder. We're turning the beat around today. Covenant Life is hosting Sovereign Grace Ministries' WorshipGod06 Conference this August. Led by Bob Kauflin, this is an absolutely essential event for anyone involved in leading churches in corporate worship through music. There will be a track for basic tech stuff as well. You can see the seminar list and register online. For all the past conferences, I've wanted to do a little more for the tech folks who are attending. What types of things would serve you when attending a conference like this? Here are some ideas that have been thrown out to me. Tour of our equipment and facilities with commentary on what we learned from our building projects. Roundtable lunches where small groups can throw out troubleshooting issues to more experienced techies. Open stage setup and rehearsals for folks to watch or even participate. Regroup later in the conference for questions, comments, and suggestions. Anyway, that gives you a taste of the types of things I'm thinking about. What else would you want to do, learn, receive, or experience? Please comment to let me know. The series on recruiting continues. Here are Part 1 and Part 2. We must give prospective volunteers the next step for them to move from interested to involved. If we don't give them direction for their next move, they will likely get stagnated in the mire of the recruiting process. However, our teams must also have some sort of tracking system in place, so that we know where new people are in the process of getting involved. We have a responsibility to follow up with them and with other team members who are going to be training them. This is an area where I, honestly, fail miserably. So, I'm writing to myself as much as to anyone else. Even if you don't hand it out, have your recruitment process on paper with all the if...thens spelled out or drawn up. Keep a file -- paper or word doc or email doesn't matter -- for each person who has expressed interest in your team. Note all your communication with them in that file, especially the next step you've given them to complete. Give them a due date, even if you don't share it with them. Add a task to your task list (you do have one, right?) to contact them for follow-up. One final suggestion: Delegate this to someone else. You don't actually need to be the driver. If you are not strong administratively, find someone who is and have them be the recruitment guru for your tech or media teams. How do you keep track of potential volunteers? When you have a 6-month old, you start reading things that manly men aren't supposed to read, like the blog girltalk, by Carolyn Mahaney and daughters. (Actually, I'd encourage guys to read this great stuff, unless they tell you not to.) They've been talking about children's schedules lately, and it's been encouraging to me as my wife and I try to get our beautiful little baby girl to stop waking up twice at night. What you're about to read are just my thoughts on screen content and imag. These are not laws of good video, bad video or otherwise. If you do more, you're not necessarily being distracting. If you do less, you're not necessarily wasting your medium. I would just encourage you to know why you are doing what you're doing. Here are my various thoughts. Like: Show me the lyrics! If I'm supposed to sing along, I need to see the lyrics. Unfortunately, neither my friends nor I have the songs memorized. Like: Show me they lyrics early! I challenge our folks to aim for 100% accuracy but still get the next lyrics up fast enough for the congregation to read the entire first line before they have to sing it. That's tough, but they do pretty well at it. Dislike: I'm not a big fan of imag during congregational singing. I'd rather see more words and less people because the words help me think truth about God more than a picture of a person, even if that person is worshipping God. Even more distracting to me is the typical shot of the percussion player during the musical break or guitar player during his solo. I think it has the potential to cause people to notice the music more than the truth of the words. But that's just my take. Like: A simple background behind the lyrics is a nice touch that can help bring visual coherence with whatever set design or bulletin theme you are using. Dislike: Landscapes. Is it just me, or is this way overdone? Like: For more performance oriented music, I think imag can have an appropriate place. Like: Slow camera moves. When I'm camera director, I describe the moves I want as impossibly slow. That's in part because our zoom triggers are not variable (things you learn too late), so slow is nearly impossible. But it's also because fast is can easily become distracting. Dislike: TakeCamera1TakeCamera4TakeCamera3TakeCamera4TakeCamera2. As I alluded to last week, the music television culture has standardized using lots of quick, on-the-beat camera transitions. That tends to emphasize the musicality of the song rather than the content. I would instead encourage you to attempt to switch cameras for a content-driven reason whenever possible. Like: Switch cameras in-between sentences. This is the most natural and least jarring moment to switch cameras. Dislike: Switch cameras when the person starts to move. One camera has the tight shot, which is used when the person is still. When he starts to move, they cut to the wide shot. This seems to subjugate the content to the equipment. Like: Stick with cuts the whole time. Dissolves indicate a time or location change in our TV culture, and it also seems strange to see two of the same person on the screen in a speaking context. But I could be too influenced by the culture here. Dislike: Cuts to graphics. Whoa. That's jarring. Dissolve back and forth between imag and graphics. And some people accuse me of being too unopinionated! I'm sure someone out there disagrees with me. I'd love to hear your comments, suggestions, rebukes. Remember, these are just my thoughts, not God's thoughts. Some things make me feel old. Other than the fact that I am old, some of those things are the birthday that I'm facing this week and the amazing amount of time that's passed since I graduated from college. Yes, I did graduate from college. Some of you that read my posts on Gain Structure may have been wondering if I even went to middle school. A good friend of mine, who heads up the sound crew here at Covenant Life, pointed out some errors in what I wrote, so I thought I would correct and clarify as appropriate. You may have noticed a slight discrepancy between the drawings in Intro to Gain Structure and the actual steps of application that I listed. The discrepancy is that the drawings line up the top of the dynamic range, or the point of distortion, of each piece of equipment. In my application steps, I recommend that you line up the 0dB points of each piece of equipment. To be sure they are not the same thing, and I was aptly corrected. To maximize dynamic range, one must actually line up the point of distortion of each piece of equipment. The goal is to have each piece of equipment clip at exactly the same time. However, to find the point of distortion, you must have access to an oscilloscope or some other measurement device that will show you the clipping point at the output of each piece of equipment. I wouldn't recommend trusting the "peak" meters on your equipment to find that point. Because not everyone has an oscilloscope, I still think it is fair to use the 0dB point to match up your gain structure. It is simpler and it will improve almost any sound system when done correctly. If you are a stickler for perfection and have the equipment, definitely line up your gain structure according to the point of distortion. If only 1 channel is turned on, the master outputs are at 0dB. With 2 channels, they hit +6dB. With 4 channels, they charge to +12dB. 8 channels = +18dB; 16 channels = +24dB; 23 channels = +25dB to +26dB. Please know that this is only true if all of your channels are exactly the same thing, such as a tone or pink noise. It will not add up quite as dramatically in the real world because the different sources are not perfectly coherent like this. However, the general principle is still true. If I've made further errors, please let me know! I am not perfect. I don't have this all figured out. And sometimes in order to be clear, I'm not quite correct. Thanks for understanding and for reading nonetheless! 1 Corinthians 10:31 says, "So, whether you eat or drink, or whatever you do, do all to the glory of God." This is the theme verse of Covenant Life's Junior High and High School Ministry, which we highlighted this Sunday. The youth completely took over the church. Teens were swarming around the lobby as people entered to greet and hand out the bulletins. The youth band led us in singing songs of worship to God. We saw a year-in-review video from youth activities during the 2005-2006 school year. One youth pastor, Grant Layman, led the meeting, and another youth pastor, Dave Brewer, preached. We also got to hear from five of the teens, as they shared with the church portions of their Senior Challenges. Earlier in the spring, eighteen seniors spoke to the underclassmen, explaining what God had taught them during high school and challenging their peers to pursue God full out. Here are excerpts from the Senior Challenges that we heard today. Stacey :|: "Don't wait until you are older to really start to read and meditate on God's word because God can use you right now." Brett :|: "Pursue your parents as friends by building a close relationship with them... Open your whole lives to your parents and experience the grace of God." Timi :|: "I urge all the youth not to live in deceit. The pleasure gained from it will only leave you wanting more. The world does not satisfy. Only God satisfies... Confess your sin and find true freedom in Christ." Hannah :|: "One of things I have come to love the most [about our church] is the protection it brings us... God has placed our church as well as our parents and our pastors in our lives, so that we can stay as far away from sin as possible." David :|: "What could be more important than being prepared for the day you die?... Either the gospel is true or it's not... If none of it's true, then why bother. But if it is true, the implications are so huge, how can we live as if it is not true?... I would encourage you and challenge you to ask God to help you live this day as if it is the last day or your life." You will soon be able hear the complete Senior Challenges here. Dave Brewer shared a brief message on the grace of God in our teenagers. Truly God has been good as dozens of seniors graduate high school each year and attend college near Covenant Life because they love the church so much. Only God can create a truly multi-generational church where grandparents, parents, and children worship God at together. Finally, we watched the 10:31 Award Video. One man and one woman are chosen from the senior class to receive the 10:31 Award. Parents, teens, teachers, pastors, and small group leaders all vote, I believe. The Award goes to the two students who have best exemplified the theme verse: doing everything for the glory of God. I want to give my congratulations to Beth, one of this year's award winners. She serves on the lighting crew, and has been a joy to work alongside. Beth, you have my deep respect and I can't wait to see what God does in your life in the future! Lastly, I want to thank all the other youth that serve on our production teams. Over 1/3 of the volunteers on the technical teams are under the age of 18 years old. That's about 50 high schoolers who give away a significant portion of their free time to assist in proclaiming God's Word clearly and broadly. Thanks for making my job such a joy and, more importantly, for doing everything to the glory of God! I want to begin by exploring the first main idea. God sees everything. Now that's a strange thought. Right now, I can see about seven feet in front of me, three feet to my left, ten feet to my right, and -- because I am not a mother or a teacher -- zero feet behind me. My view is limited. In fact, though there are dozens of people here in the church building with me right now, I can't see any of them. Meanwhile, God sees me and everybody else at the same time. What's more, God truly "sees." He doesn't just see in the visual sense. He sees in an all-knowing way. He sees my thoughts as well as my body. He knows my motives as well as my actions. God watches. He isn't just seeing me like I view a movie: laughing, crying, and then walking away. He evaluates what he sees. He evaluates what I do and what I think. He isn't ambivalent. He cares about my life and my heart. The question, then, is this: do I care that he cares? I think this gets at the heart of "fearing the Lord." Do you care that God is watching you and evaluating you? Do you desire to please him? Do your thoughts and actions change as a result? Let me take a quick sidestep for a moment to remind you that -- if you believe that Jesus Christ died for your sins -- there need be no thought of wrath associated with "fearing the Lord." Jesus paid our penalty in full. The fear that is ours as followers of Jesus is an awe at God's multifaceted perfections. In sending Jesus Christ for our sins, he fully demonstrated his justice, his mercy, his love, his wrath, his faithfulness, all at the same time. The appropriate response is zeal to not displease him, for he has loved us so fully and extravagantly through the cross. Do you have that zeal? Do you have a passion for God's glory through every moment and thought? The person who truly fears God will "obey in everything." You will see marked excellence throughout their lives. The person who truly fears God will serve with "sincerity of heart." You will see honest joy as they serve. The person who truly fears God will "work heartily." Even if perfection is not within their grasp, they will give their full abilities to their tasks. Does your life bear the marks of God-fearing service? Remember, "you are serving the Lord Christ," who sees and cares. We have two very different services on a Sunday morning - one of which sometimes gets complicated, the other which is more formulaic. I play the "producer" role for the former, but this role is not really needed for the latter so I am not part of that service. But because I help with the transition between services, I'm often asked for a piece of sound gear or a lighting adjustment or something like that. In an effort to try to maintain clear lines of duty, not step on any toes, and keep the confusion about whose job is what, I will often redirect such requests away from myself. And I find that it's important to be clear on what your role is (ie. it is not to do everything you are asked to do) in order to maintain proper boundaries and some degree of sanity. But that that starts to sound like "I'm off the clock", or "That's not in my job description". So I'm wondering what mindset is that goes along with not having the above two attitudes? How do you find the balance? How do you maintain sanity and boundaries? How do you avoid guilt from saying "no"? I responded to him briefly to clarify one aspect of the sermon, Jesus on Serving, in which our senior pastor was challenging the "I'm off the clock" and "That's not in my job description" attitudes. He was speaking primarily to people who are not serving at all or who are significantly underutilizing their gifts. However, I think that Jim's questions are excellent ones that many technical teams face, so I'll answer them as best as I can. Let me begin by wholeheartedly supporting specialization on volunteer teams. I believe that clear roles are essential to succesful technical teams. Positions, policies, checklists, instructions, procedures and the like are required when non-professionals work with other non-professionals to use specialized equipment and create an excellent product. However, team structures, procedures, and policies fall into the category of "law." "Laws" exist to enforce order, direct communication, set standards, and provide accountability. The law in the Old Testament provided guidelines, so that Israel would know the righteous expectations of their God. Those righteous commands were not arbitrary, though. They encouraged lives that not only pleased God, but would serve the Israelites by providing blessing from God, social peace, and strong families. However, the law was a double-edged sword. While it provided guidelines for righteousness and the potential for blessing, it also tempted people to do exactly the opposite (Romans 7:8). Even today, though we know that obedience to God will lead to our good, we rebel against him, incurring his wrath. Thankfully, God hasn't left us there. He has provided the way out of eternal death by sending Jesus Christ as a Savior for sins. He has made a way for mercy to triumph over judgment. As a result, those of us who are Christians have entered into a community created not by justice or by law, but by mercy. Therefore, we should always be seeking to apply mercy as we live together in church community. With this in mind, let's discuss the idea of "redirect[ing] requests away" from yourself. How do you know if your redirection is the result of a wrong attitude? Here's a question that comes from this discussion on law that I think reveals our attitudes in saying "no." Are you seeking to be an extension of mercy or an instrument of justice? Only you know your heart in those moments. If you are filled with love, joy, and peace, it's probably because you want to be an extension of God's mercy. If you are mostly thinking about the rule or procedure that your brother didn't follow, you are probably self-righteously considering saying "no" as punishment, for the sake of justice. It is possible to be Spirit-filled and mercy-focused and still say, "No, I'm sorry I can't do that." When God's mercy is on your mind, you will desire to find a redemptive way to help and go as far as you reasonably can to truly serve the person without losing sight of the ultimate good of the church. If you respond with this mindset, you will truly have upheld the appropriate boundaries. You can say, "No" without guilt because in not doing, you are really serving. That's easy to write. To live out? Not so easy. If you ever have trouble remembering mercy, like I do, here are some ideas to think about if you are in a tempting situation. Remember that you are a law-breaker, even though the law was set in place for your good. Remember that you, if you are a Christian, are forgiven only through God's mercy. Remember that you are standing alongside a sinner that God has already forgiven for any sin they've committed. Remember that mercy reflects Jesus' character and honors God. Remember mercy. Serve. And sometimes say "no." Last Sunday was ServFest, and it's got me thinking about recruiting. Of all the topics related to team building, recruiting seems to be the one that challenges most technical and media ministries. For my own benefit and hopefully yours, too, I will be talking through some of the practical things that I understand to be critical to effective recruiting. One of those practicals is "The Next Step." Last week we discussed having a team structure in place, so that people know where they can fit into the team when they consider joining. "The Next Step" is the how you communicate the process to transform them from being "interested" to being "involved" in that team structure. From my experience this is the part where the most potential volunteers get lost. Let's reality check for a moment. Most media and tech folks are pretty plugged into the church. Those of us who lead these teams are aware of almost all events that are happening in the church (hopefully) and, if we aren't staff members ourselves, we have access to at least some members of the church staff. Eseentially, we are inside. And we can easily forget what it's like to be outside and to be unfamiliar with the way the church functions. Yet most new members and new volunteers just don't know how things work. The simply don't know how to sign up. Our job, then, is to lead them through the sign-up process. However, many times the sign-up process is not a clear easy path that is the same for each person. The prospective volunteers gifts, interests, skills, previous experience, training, and schedule will all affect when, where, and how they get placed in a position. Also, someone who comes in to join an established team in the middle of a cycle will have a different path than someone who is only one of 15 new people for a team that is just starting up. With all the complexities, I've decided not to burden our prospective volunteers with a sketch of the entire path with all it's "if...then" logic. Instead, I make it my practice to give a possible volunteer only the "Next Step." I am disciplining myself to never leave an interaction with a possible volunteer without giving them the "Next Step." Send me an email to remind me to make an appointment with you. Call Hubert on the kidstech team to see if you can shadow him for three weeks. Come to our informational meeting in July. Get your small group leader to fill out this recommendation form and get it back to me. Attend a training session for monitor operators on August 14. Hang tight. I'll get back to you. Hubert from the kidstech team will call you to tell you if you can shadow him. Sit back. Relax. Our next informational meeting is scheduled for 2008. Can you see how even a motivated person will get lost in the shuffle without a next step to take? What's your next step to give that potential volunteer a Next Step? Television, film, and live video are not only communication tools. They are also art forms. There are styles and techniques that define "good" film editing and "excellent" live television. Through what we watch on TV and in the theaters, we have learned our culture's definition of good video. In many ways, these techniques and styles offer great starting points for good imag for worship services. Ideas like the rule of thirds and the 180-degree rule are essential for both preproduced and live video in order to create what people will see as "comfortable" images and switching. The rule-breaking techniques used by music television in particular have brought new artistic creativity to video editing that provides an engaging multi-sensory experience. All these things can be used effectively in church to advance the message of the gospel. However, there are also dangers in basing our imag technique for worship on what we see on television. In the race to become relevant, I think churches have too quickly adopted music-television-like imag, which emphasizes motion, cool shots, frequent angle changes, and rhythmic transitions. Music television switching is based primarily on the style of the music, not on the content of the lyrics. Also, the editing has become an art on its own, an element of performance. In the worship of God, nothing should exist for its own sake. Anything used, including the music style, the lyrical content, the video switching, should communicate two things: truth about God and how to respond to God in love, awe, praise, or obedience. I refuse to believe that the culture should define what we do in church. Please never believe that you have to imitate what is happening in the world for the gospel to work. We need to consider what secular video producers do and then decide whether those principles are useful to communicate truth. My challenge to you is to think differently about media tools and how they relate to content. Retrain your mind to really pay attention to the ideas communicated through images rather than just accepting them because they fit into a stylistically "hip" mold set by the culture. As church media stewards, we must all to do the hard work of identifying what is going to best support the content of our songs, announcements, sermons, dramas, etc. And that is HARD work.